Whether at a home marina or transient slip, dock water can be unpalatable, full of spot-forming minerals and occasionally unsafe to drink. FCI Watermakers’ three models of DTS (Dockside Treatment System) make up to 3,000 gallons of fresh, crystal clear water every day—the average daily needs of ten typical American families. DTS also removes 99% of total dissolved solids, so after washdowns, a spot-free deck, hull and glass are easily obtained without extensive hand-drying. This dramatically extends a boat’s paint and wax life, and makes the vessel look showroom new. 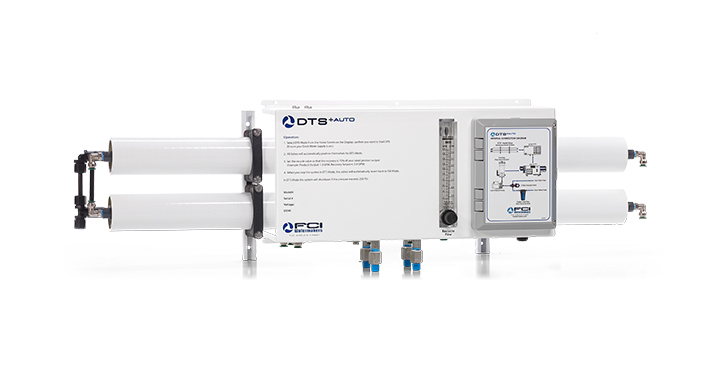 The DTS+Solo is a compact, stand-alone model that’s self-contained, complete with high-output pump, motor and membranes. It can even be installed at deck level. If the boat has an FCI Aquamiser+ or Max-Q+ watermaker, the DTS+ or DTS+Auto are the perfect addition. They’re plumbed in-line, so they don’t require additional pumps or motors. All DTS models are highly efficient and recover a minimum of 70% of dock water using minimal power. They’re quiet, vibration-free and available in a compact framed or space-saving modular design. The DTS line is built in the USA to the same high standards as FCI’s renowned watermakers. They use easily-obtainable, non-proprietary components and standard sized parts and disposables for peace-of-mind when far away from the vessel’s home port. For 30 years, FCI Watermakers has manufactured state-of-the-art watermakers with capacities from 200 to 260,000 gallons per day. Its reliable units are installed on thousands of recreational, commercial and naval vessels, as well as oil and gas platforms and at resorts and municipalities worldwide.